Happy Wednesday darlings! Hope everyone is having a fantastic week so far! I'm out of the office tomorrow and Friday for a big photo/video shoot for work that I'm "directing" so that should be fun. I love getting new experiences and this job definitely gives me the opportunity to get my hands dirty and try new things so I can't complain. What I will complain about is this crazy Florida weather. I don't think we got the memo it's supposed to be winter! Like I mentioned on Monday, this weekend had completely different temperatures than last weekend so I took advantage of the upper 70's in January and broke out this fun, mixed pattern, drop waist dress. I'm obsessed with the colors and dropped waist on this dress but I must warn you, it definitely runs a bit large. I'm wearing a size XS and it's still a little big on me but it's super comfy and you all know how I love comfy clothing. I paired the dress with my notch front booties which really elongate your legs and a fun floppy black hat. I'm not even going to lie, the hat was thrown on to hide how awful my hair was looking that day but I think it totally worked with the outfit and hopefully no one notice what a hot mess my hair was! What an adorable dress! Looks perfect with booties too! This dress stopped me in my tracks- it's so cute and I'm crazy about the bright colors! You definitely pull this dress off--I'd probably be a little afraid of the pattern if I saw it on the hanger, but it looks great on. Good luck with your shoot!! Girl--everything about this look--perfection! 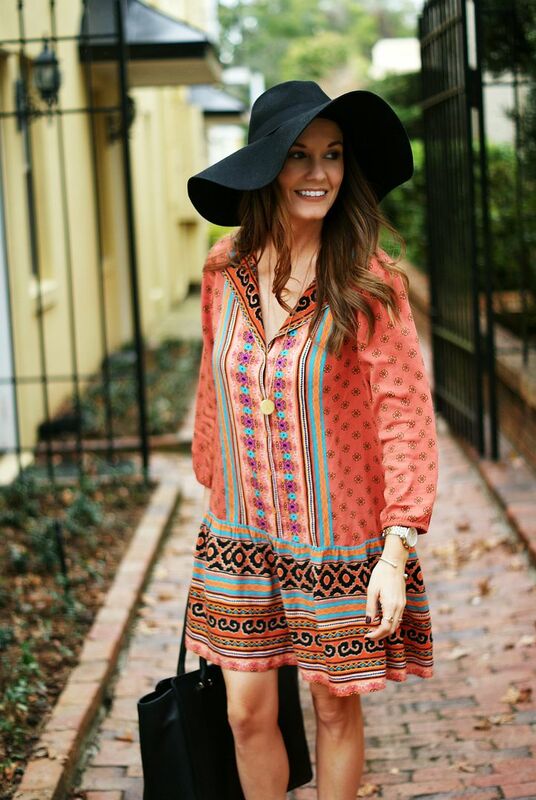 SO in love with that super boho dress and you know I adore the hat you paired with it! I love drop waist dresses! The colors in this one are so pretty too! Love this look on you! It's perfect for the temperature you guys are having. And seriously, if your hair is a hot mess I'm in trouble! love love love this dress! My sister has it and I need to borrow. If one thing is for sure i LOVE a good drop waste! And this dress is so perfect! I am obsessed with it from head to toe! Looking super cute! BB Dakota is one of my favorite brands. This dress is so adorable on you, and I am digging the boho vibes. ok you know i love a good drop waist dress! i have a couple from anthro i just adore. this one has the best colors! and the booties are a fun touch. yay for getting out of the office- i hope the weather cooperates too! happy hump day girly! You look so darn cute! I love the colors in the dress as well...especially loving your booties! Hope the shoot goes well, girlie! Such a cute look and silhouette on you! Good luck on the shoot! 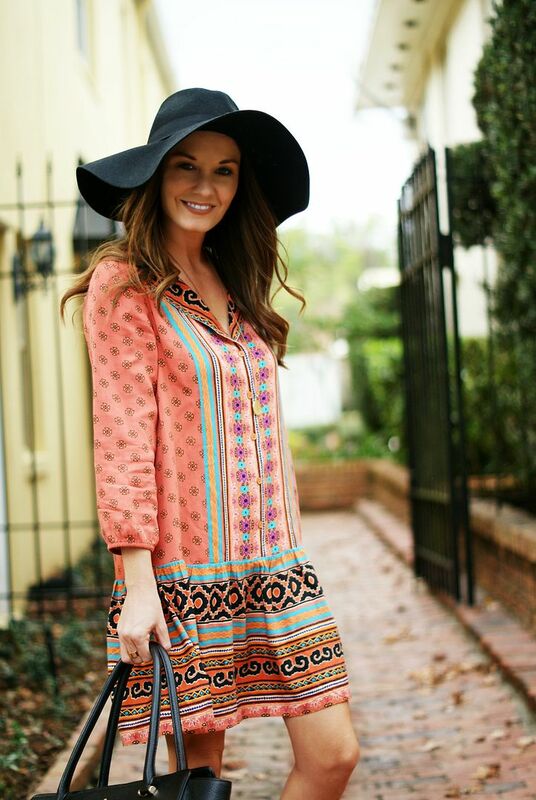 You look so adorable, the hat and booties are the perfect compliment to that dress. Thanks for adding the sizing info. oh, what a pretty dress! the booties are gorgeous as well, and your hot mess hair is way cuter than mine when it's a hot mess haha. i need to try the hat instead of current go to - a top knot ;) lol. have fun directing stuff! Loving this boho look on you! So cute! How cute do you look?! I love this dress and it looks so cute paired with the black accessories. Also, super jealous you can wear this in January! Adorable pattern of the dress and the black booties go so well with the outfit. 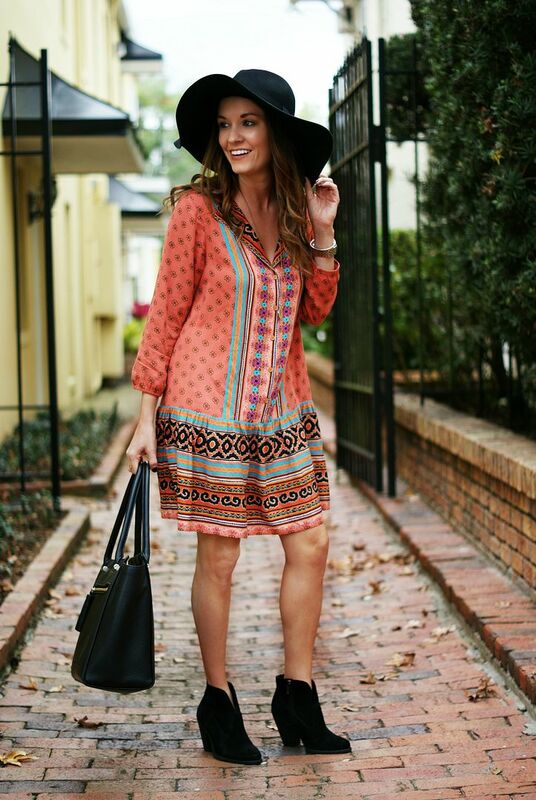 The print on your dress is so cute, and I love how you paired the hat and the booties with it! I hope that you're having a blast on your photo shoot! Such a fun dress! I love the patterns and colors - so pretty! These colors are GORGEOUS on you! (Same with the dress!) And.... I have MAJOR hair envy!! Love your waves! Drop waist dresses are my ultimate fave! Yours is so cute! 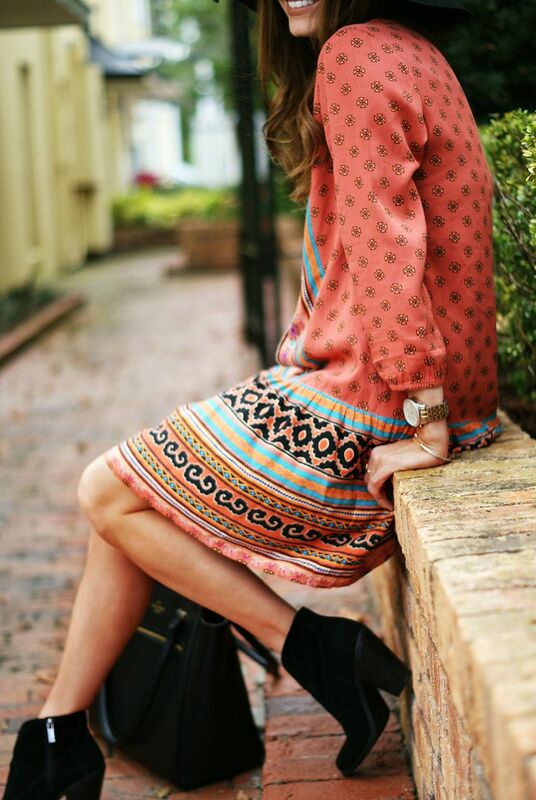 So breezy and boho- the perfect dress! Love it with the black booties + hat! 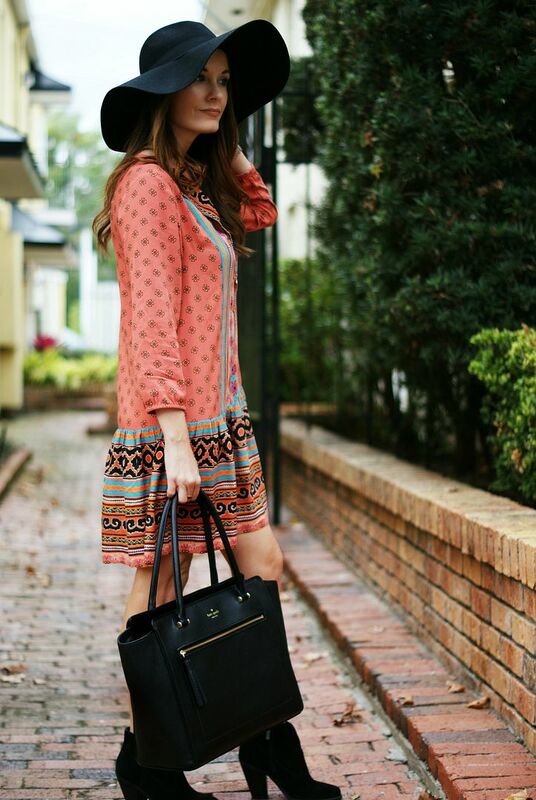 I love your dress and the black booties and stylish hat make this dress pop. Hope you are enjoying the warm Florida weather. NYC weather is 50F one day with rain and 25F and snow the next day. I take your weather any day even if its 40F something at night once in a while. I love a great drop waist dress! This one looks so cute on you, especially paired with that hat! This is a super cute boho look! I love those blank ankle boots with the dress! I love the colors on this dress. It reminds me of Sante Fe. Loving the color of the dress and the print is perfect! It goes so well with your hat and booties too- so cute! I love this look so much! Your dress is so pretty! hope you had a fantastic photoshoot!